This is an introductory course in acting. Students will take part in improvisations, warm-ups, team building, memorization, movement, staging, blocking, and duet performances. Character development, vocal and physical techniques will also be explored. This course will utilize and expand basic acting techniques. Students will create characters using emotional, intellectual, and social characteristics. The analysis of dramatic literature will be used to enhance the performance of acting. 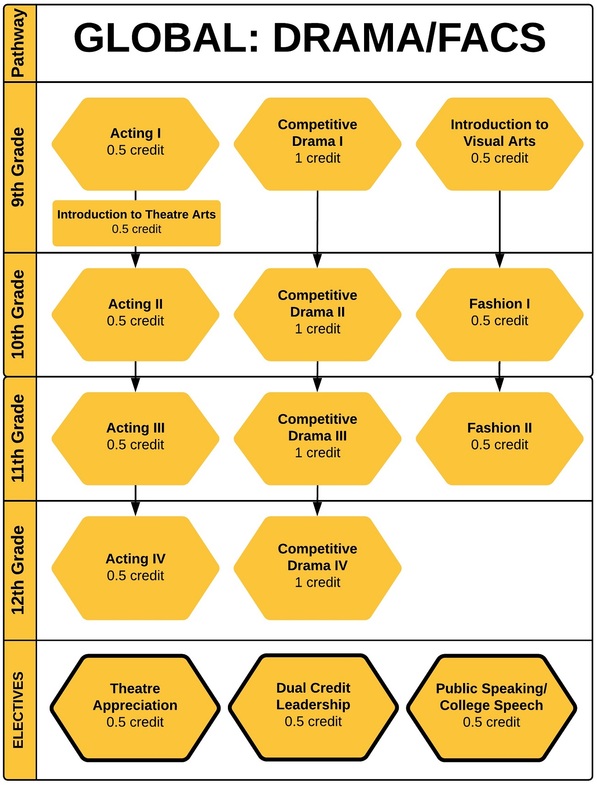 Students will incorporate subtext, motivational units and dramatic build to assigned scene work. The study of different acting theories emphasizing works from the American Theatre will be explored. Basic stage combat will also be explored. This course will require students to stretch their acting abilities into different genres and periods of theatre. Students will perform scenes and monologues from contemporary, modern and classical theatre and children's theatre. Playwriting will include the study and analysis of dramatic literature. This course will prepare students to further their interest in theatre, primarily acting and directing. Students will accrue a collection of contrasting audition monologues and compose a professional resume. Students will direct a short play or one-act. Students will also explore the history and elements involved in producing musical theatre. This course is designed for students who want to improve their skills in acting and performance. Activities in humorous and dramatic interpretation, prose and poetry reading, duet acting, and duo interpretation allow individuals to refine acting skills and techniques. Participation in interscholastic competition is required. Students must remain eligible as defined by MSHSAA. This advanced course is designed for students who want to improve skills in acting and performance. Activities in humorous and dramatic interpretation, prose and poetry reading, duet acting, and duo interpretation allow individuals to refine acting skills and techniques. Participation in interscholastic competition is required. Students must remain eligible as defined by MSHSAA. This course is designed for all students to review or learn basic knowledge of art by mastering the competencies of art history, criticism, aesthetics, and production. Students will learn the elements and principles of art, know how to use them, and create pieces of artwork that display this knowledge. In addition, students will be participating in subject-related reading and writing activities and have outside class assignments. Students will be expected to solve problems using higher-order thinking skills. This course is the prerequisite for all future art courses. Explore the exciting career of fashion merchandising and design including fashion trends, elements and principles of design, textiles, design production and construction. The course also focuses on creating, merchandising and marketing. Students will develop leadership and employability skills essential for careers in fashion. Students will be required to provide supplies for labs and construction. Are you ready to enhance your knowledge in the area of fashion merchandising, construction and design production? You will discover a variety of visual merchandising techniques, research development of designers and career options, clothing history and textiles for construction. Continue to enhance your leadership and employability skills essential for careers in fashion. Students will be required to provide supplies for labs and construction. This is an introductory course in which students will learn the basic design in all technical theatre. This will include: sets, properties, lighting, sound, costumes, make-up, house management, and publicity. Various career opportunities in technical theatre will be explored. This course will refine acting skills, provide instruction in both production projects and preparing audition materials. Students will demonstrate knowledge of historical periods, production styles utilized within historical periods, research historical topics relative to theatre, and correlate research materials into a written paper. This course begins with the development of intrapersonal and interpersonal management. Students will practice such leadership skills as effective oral and written communication, history of leadership styles, parliamentary procedures, problem-solving skills, strategic-planning skills, team building, motivation theory, stress and change management, and conflict resolution techniques. Students will have a major project as they analyze and resolve a problem in an organization. This course is designed to improve students' public speaking skills in real-world communication situations. The class challenges students to become more effective speakers and listeners in a variety of communication tasks. Students will participate in group discussions, research, listening exercises, and prepare various speeches individually, and learn to both give and receive constructive criticism.